In the kingdom of Bamum located in the grass fields region of Cameroon, the rulers were known to own and adorn themselves with lavishly beaded objects of art. These included beaded clothing, sculptures, regalia and adornments. The oldest beaded sculptures from the Bamum date back as far as the beginning of the nineteenth century. This includes a royal figure which was crafted during the second half of the nineteenth century and which has now found a permanent home in the collection of the National Museum of African Art. 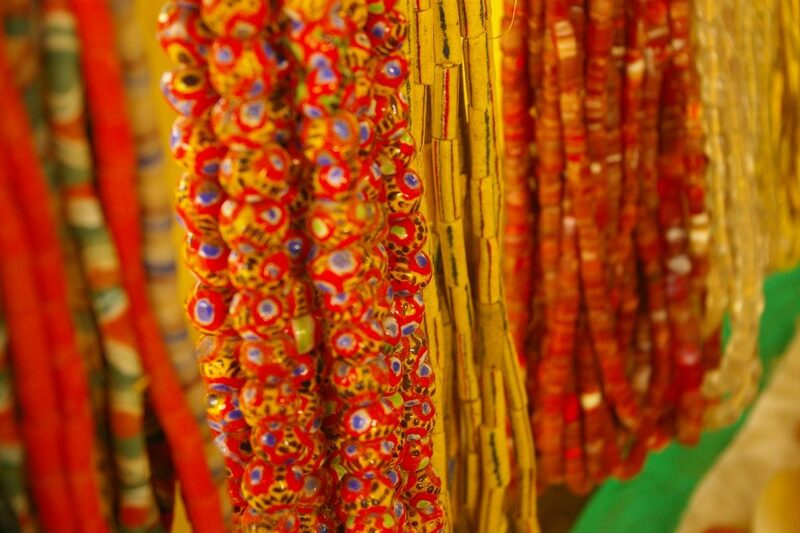 Bamum has a fascinating and rich history in beadwork. 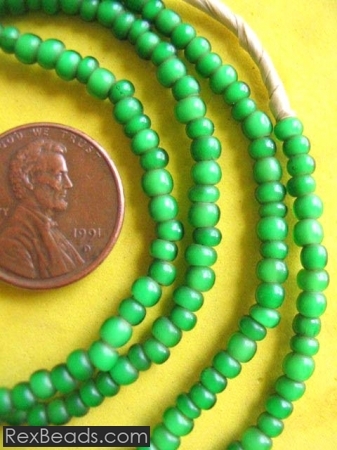 It is worth noting that beads were a rarity during the beginning of the nineteenth century when the Bamum kingdom was expanding from a smaller state into the largest kingdom in this grass fields region. Small seed beads known as memmi had to be imported via middlemen from Nigeria as well as the Cameroonian coast. 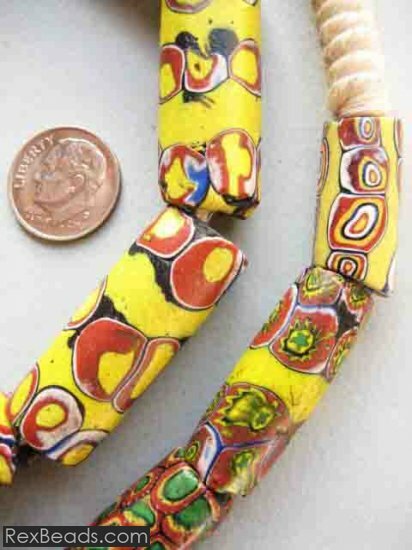 The rulers of Bamum retained control of both the distribution and use of beads in the kingdom during this time. However, the supply of beads increased towards the turn of the century, thus leading to a proliferation of bead crafts. 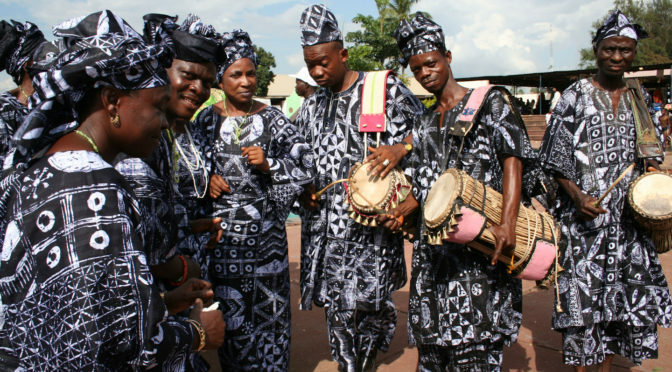 The kings of Bamum were also in control of the bead workers who originated from the small kingdom of Mamegnam which the Bamum had conquered at the beginning of the 19th century. These bead makers were therefore relocated to the palace at Bamum where they were to work exclusively for the king and the palace court in creating large beaded sculptures, intricate headdresses and beaded embroidered clothing items, necklaces, bracelets and belts. 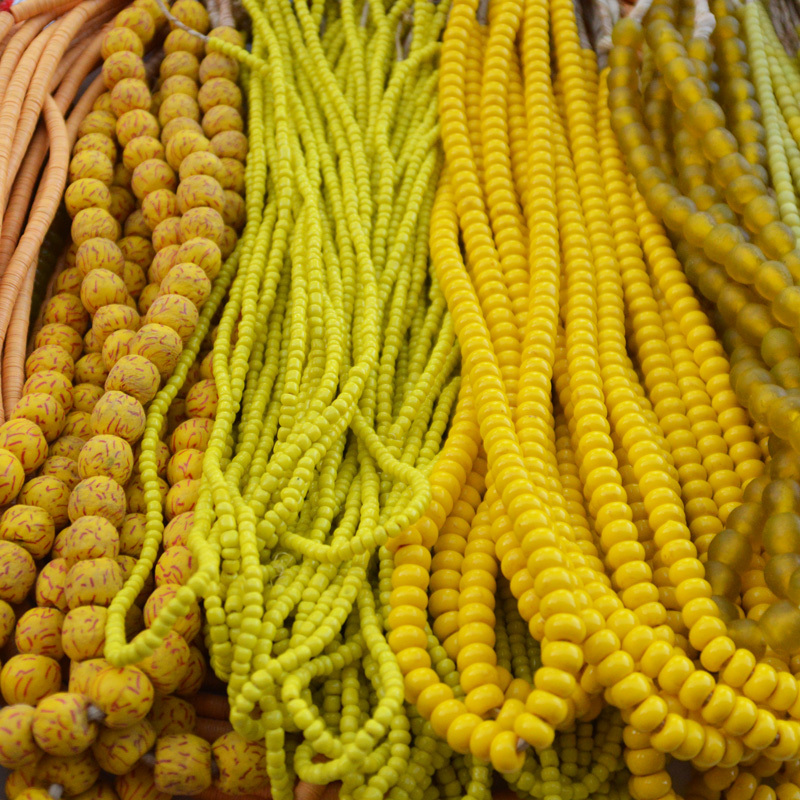 Yellow is a common color for older antique beads mainly because this color was a popular choice for trade beads in ancient times. 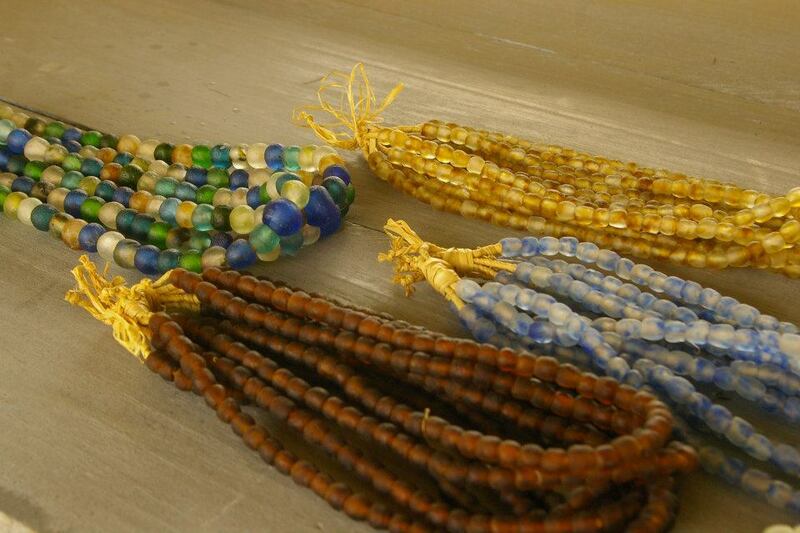 Yellow beads were also common during ancient times, mainly because the color yellow was easy to create. 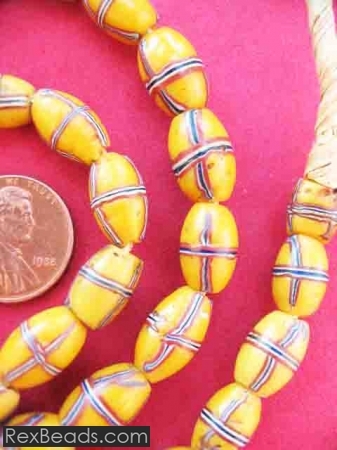 As such the color yellow was obtainable in the form of dyes which were then used to give the beads that distinct yellow color that they still retain centuries later. 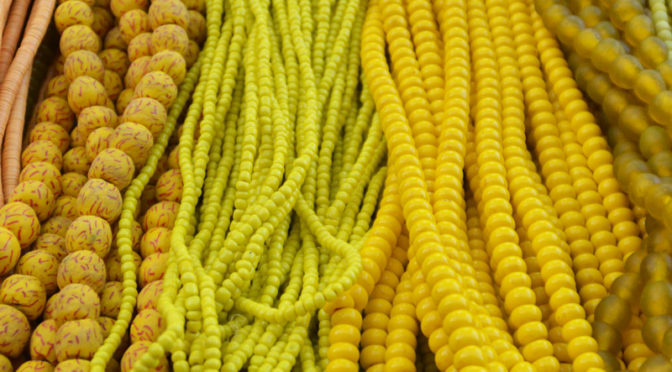 Old antique yellow beads were valued for their attractive color which attracted attention and made the wearer of a yellow bead jewelry item stand out from the crowd. 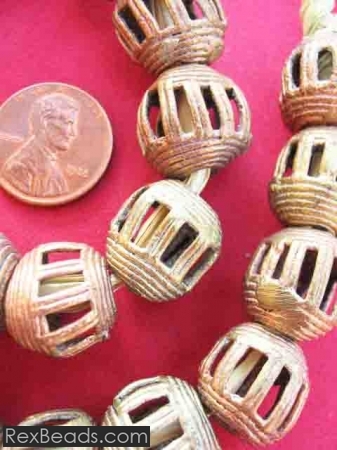 Older antique beads are over a century old and are very rare. Today, old antique yellow beads remain just as attractive for use as embellishments on clothing as well as standalone jewelry pieces. 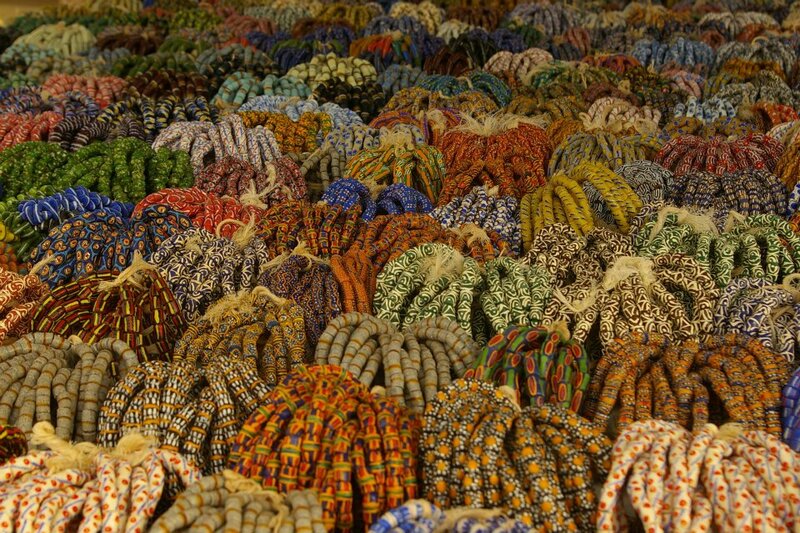 African trade beads originated from Europe and were in the past used for trading purposes in Africa in the period between the 17th century and the early 20th century. 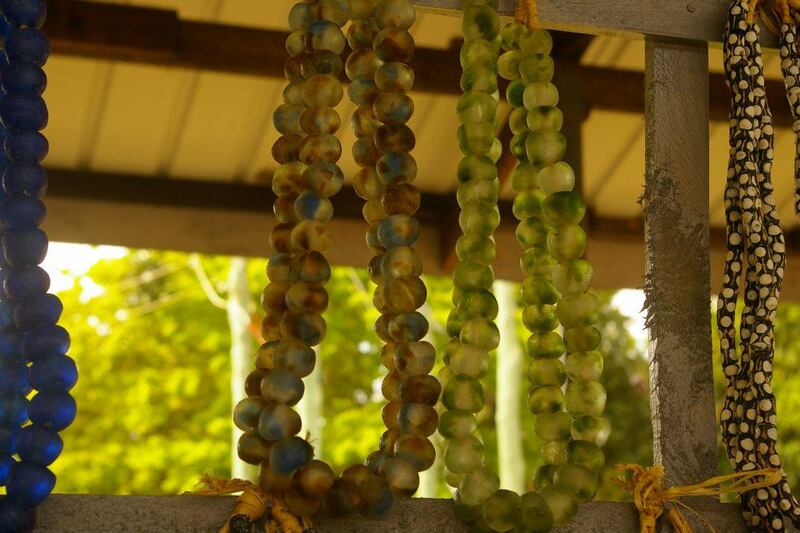 Before the abolition of slavery, these beads were historically used by chiefs as currency in exchange for slaves, as well as gold and ivory. 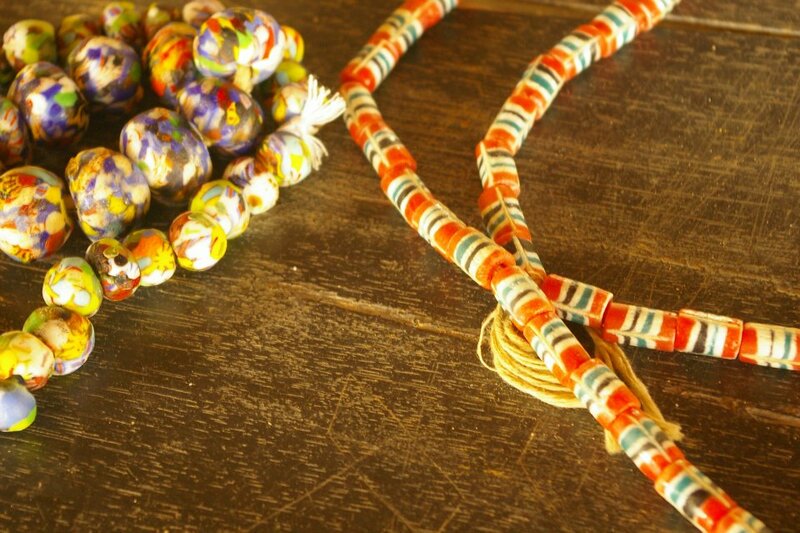 African trade beads were also popular amongst the African men and women of social standing as they were also a symbol of wealth. 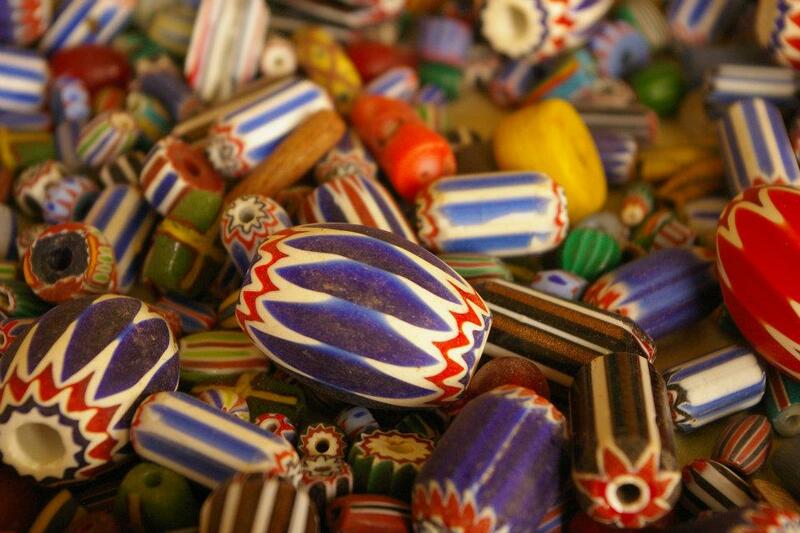 One of the most common materials used to make African trade beads in the past was Venetian glass. Other materials included wood, metal and coral. 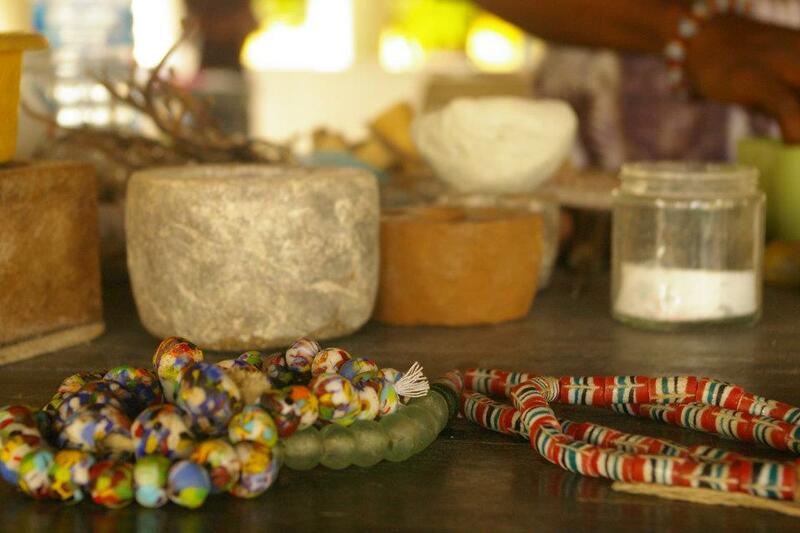 Today, African trade beads are becoming common accessories on the bodies of discerning females. Both girls and women, whether African or not, are embracing African trade beads and adorning their bodies with exquisite jewelry items such as bracelets and necklaces. 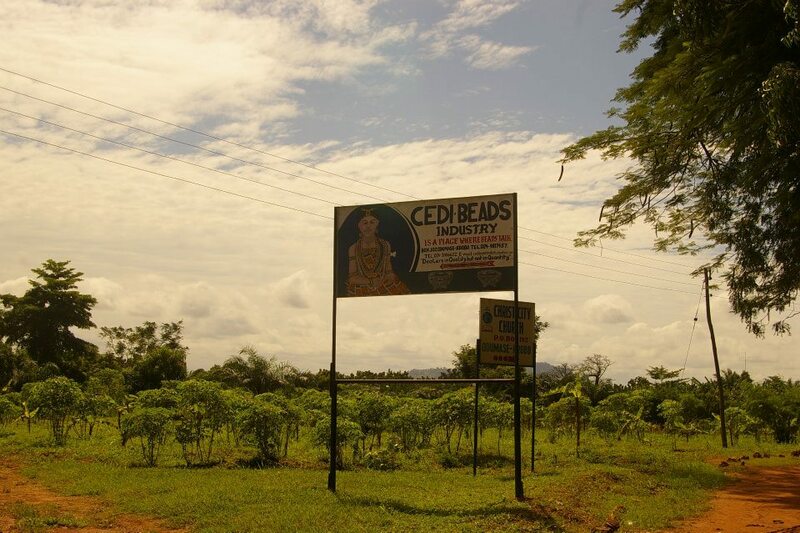 Hobbyists also indulge themselves in beading projects using these beads, while African history enthusiasts are fast becoming avid collectors as well. 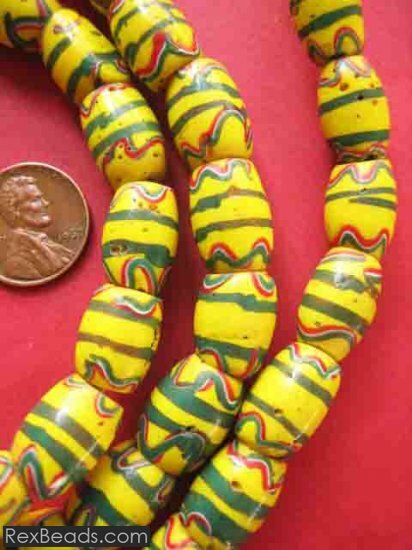 African trade beads came about as a result of the need for traders along the route between Europe and Africa for a currency to trade with the Africans. 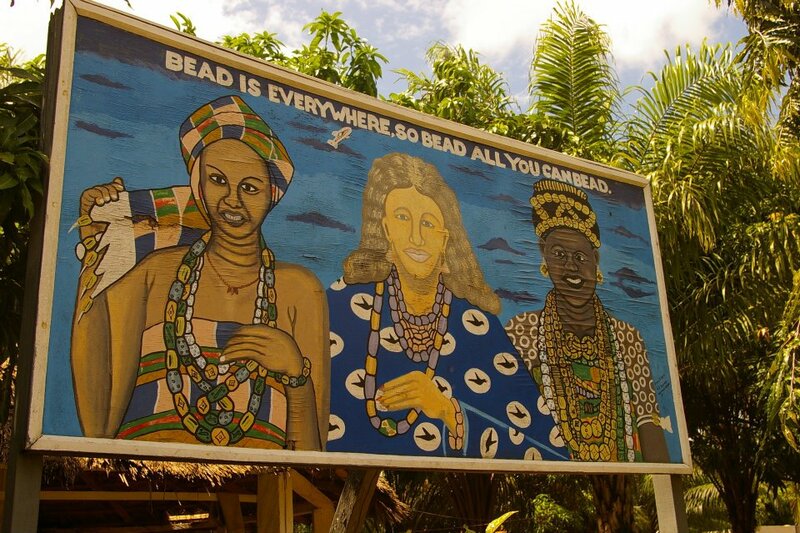 Beads fitted here as the most appropriate medium of exchange due to the affinity that African people had for various types of beads. The trade beads were therefore used for purposes of battering goods of value from the peoples of Africa such as ivory, gold, and palm oil. The history of African trade beads dates as far back as the fifteenth century with the coming of the Portuguese. Upon arrival in West Africa, the Portuguese discovered just how important beads were to the African people. 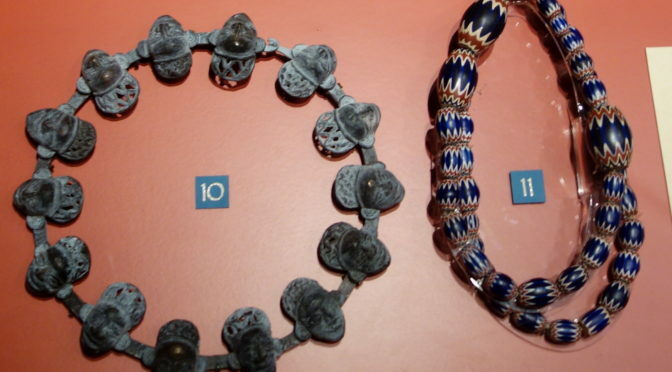 The beads they found were crafted out of various objects and materials including gold, iron, ivory, organic objects and bone. At the same time, the Portuguese discovered that the resources that the European market was desperate for were in abundance in Africa. 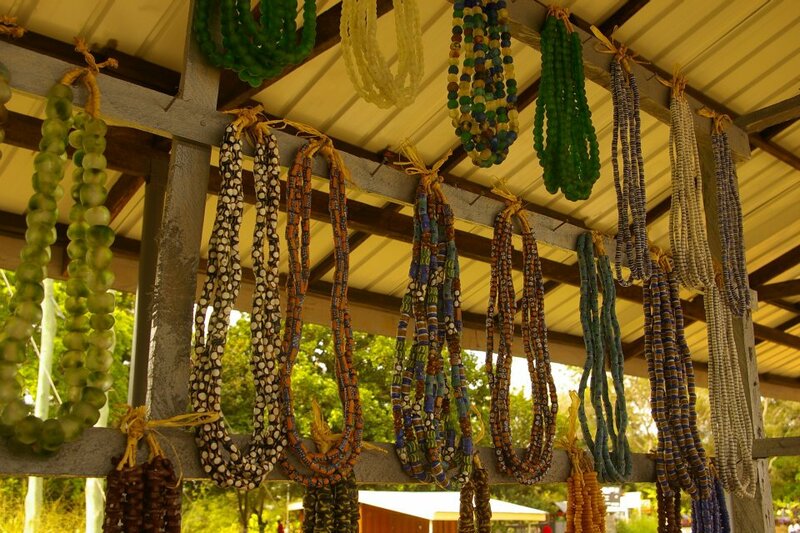 The traders therefore decided to use glass beads as a medium in bartering for goods and raw materials with the Africans. 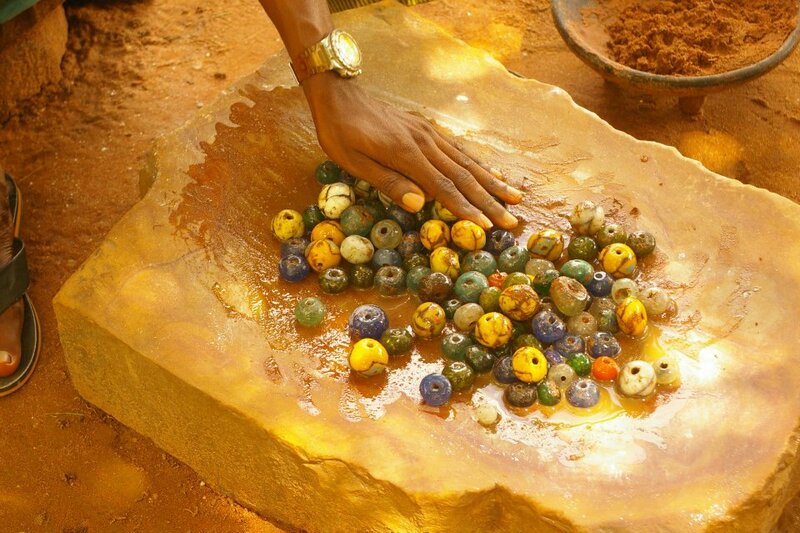 Glass beads were particularly singled out because glass working technology had not yet been discovered in Africa. 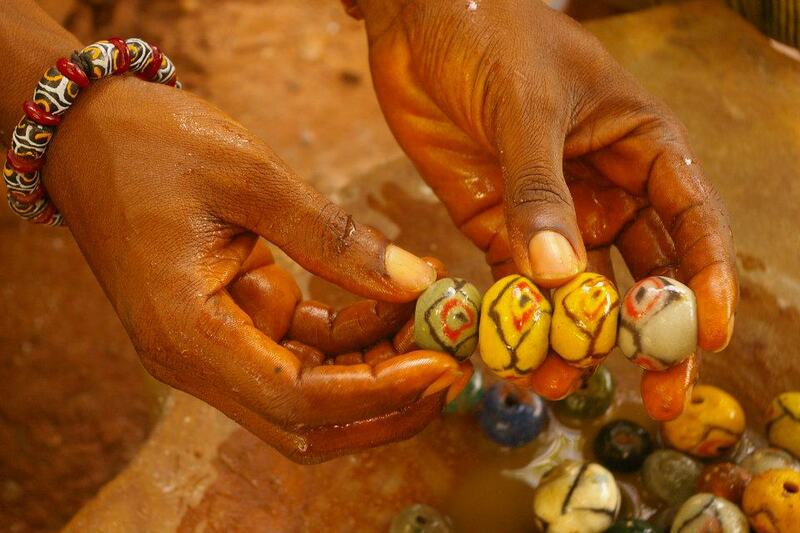 Therefore, the African people were in awe of the exquisite beads of glass that the European traders had to offer. 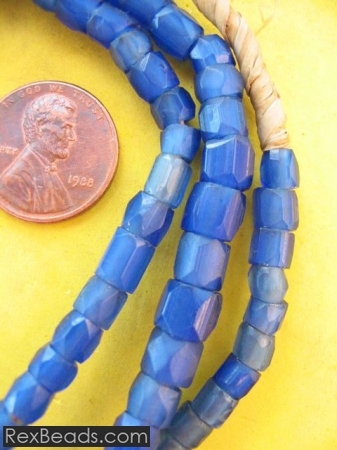 Because these beads were also used in bartering slaves, they were to later earn the name “slave beads” or aggry beads. 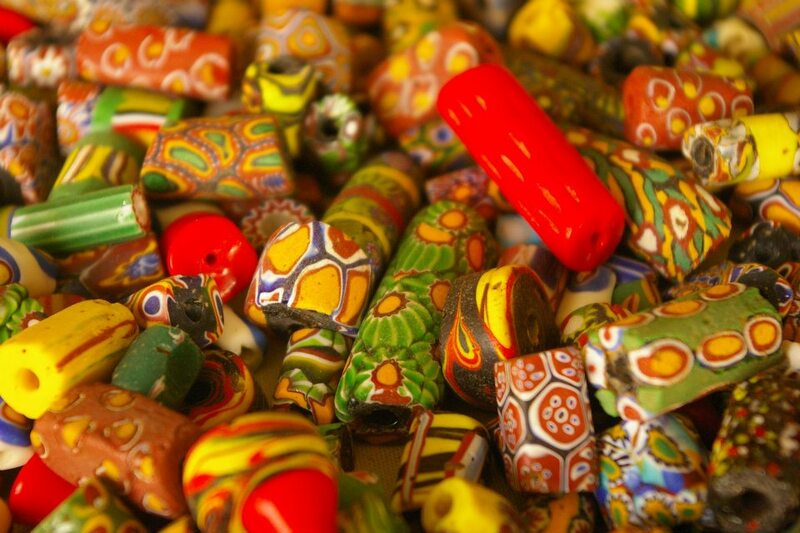 Europe responded to the popularity and increased demand for African trade beads by increasing production in cities such as Venice which is today still famous for its unique and rare glass beads. 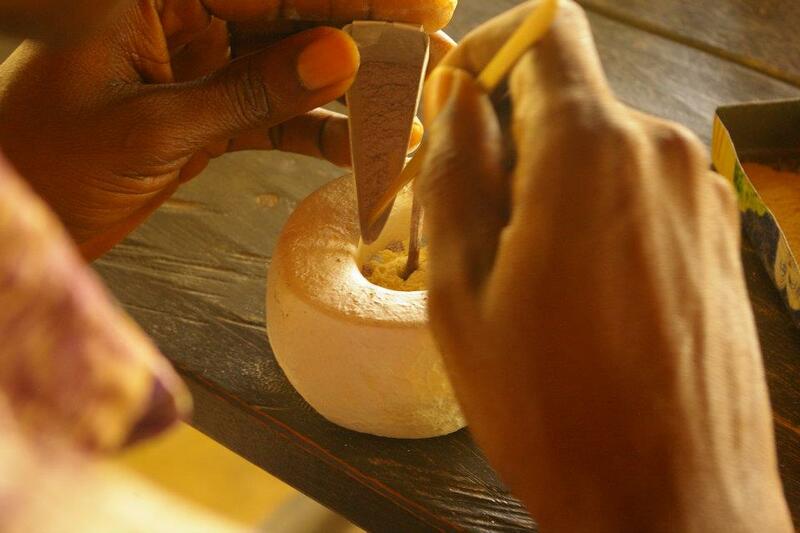 Here are a few pictures of the Bead Making Process from Africa. 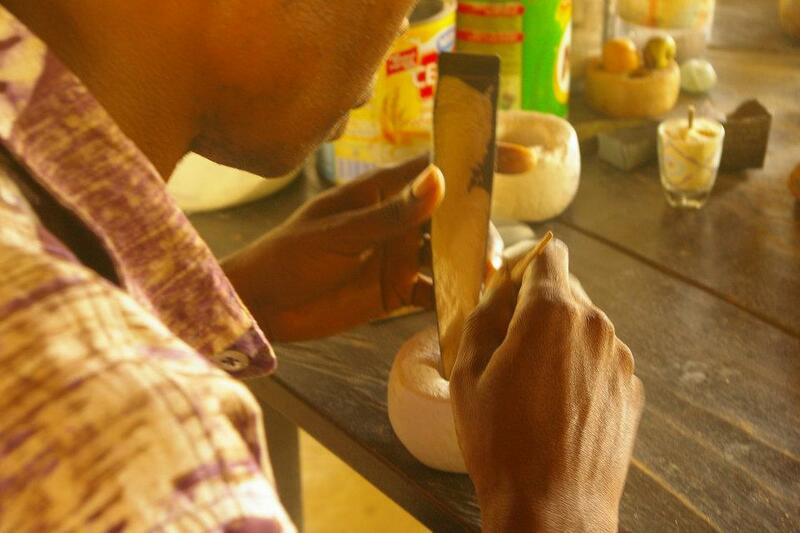 Included pictures are of the making of the molds, the firing of the beads, adding of designs, and the final product. Most of the beads shown are Ghana and Kakamba Beads. First, wash the bottles and other glass items to be used, and then sort by color. 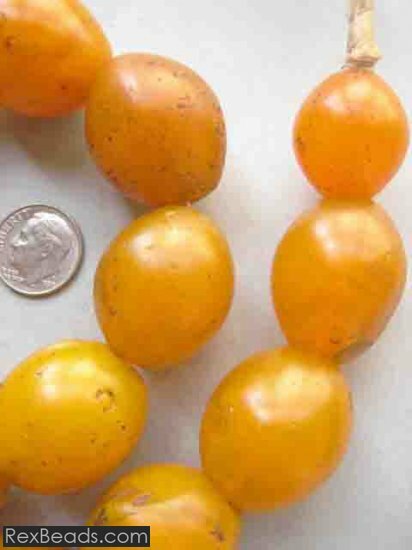 Break these down into small fragments to be used for the translucent ones. Alternatively, pound them with a metal mortar and pestle, and then sieve to obtain a very fine powder to make the powder glass ones. Use ceramic dyes to create different colored glass powder. Next, place the powder in clay bead molds coated with kaolin to prevent the fused glass from sticking to the surface. 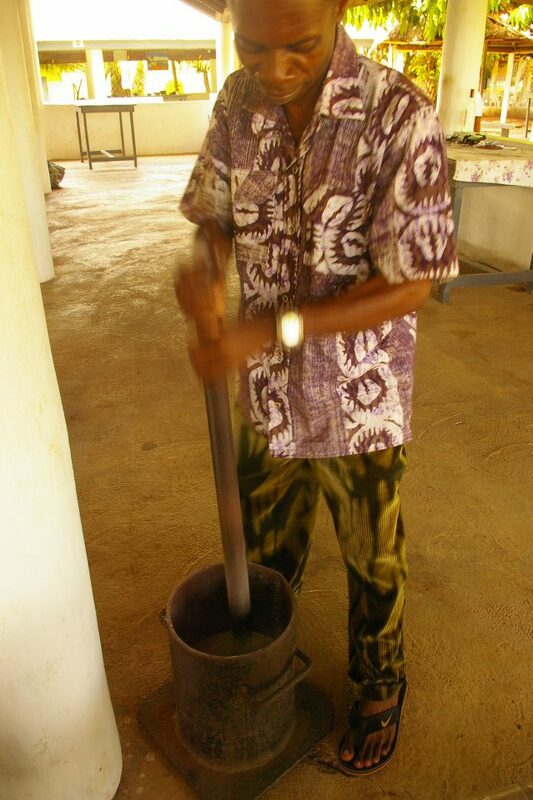 Put cassava stalks into the molds containing colored glass powder. These stalks will burn during the fusion and leave holes to allow for threading. 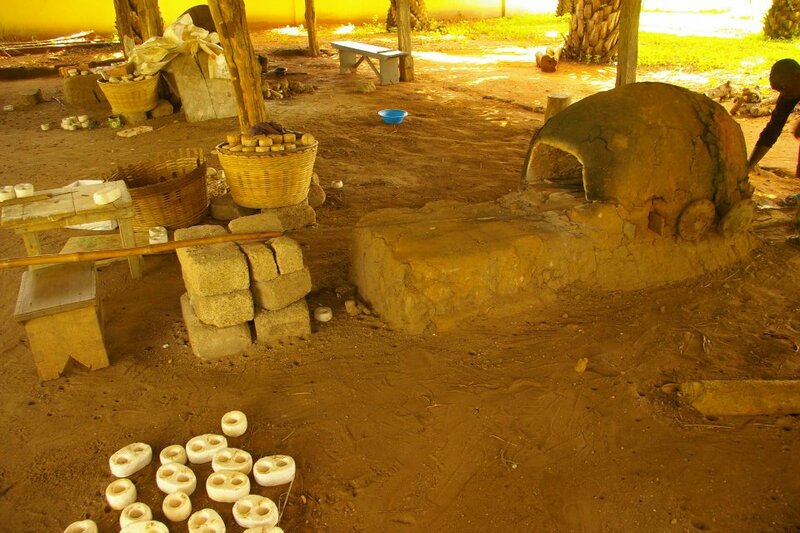 Cook the beads in a traditional kiln made from termite clay. Translucent ones cook for 35-45 minutes at 850-1000 deg. Celsius; while powder glass ones cook for 20-30 minutes at 650-850 deg. Celsius. Cook the painted ones twice – the second time in order to fix the paste of colored glass powder used to decorate them. 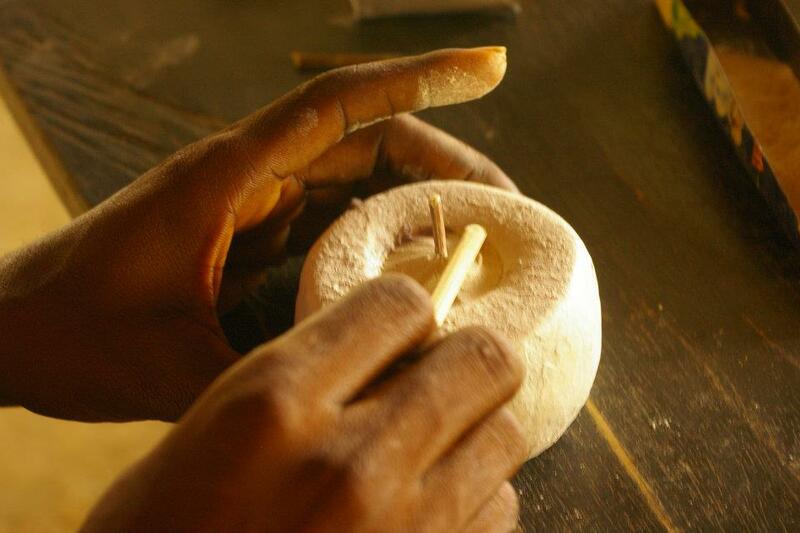 Once the translucent ones are removed from the kiln, make a center hole using an awl. One awl will maintain the mold in place, while the other will turn the bead around in the mold to shape it. In the meantime, the fused glass will slowly harden at room temperature. Leave the beads to slowly cool in the molds for about one hour to prevent them from cracking. Take them out of the mold, and then wash and polish them by vigorously rubbing them with sand and water on a smooth stone surface. 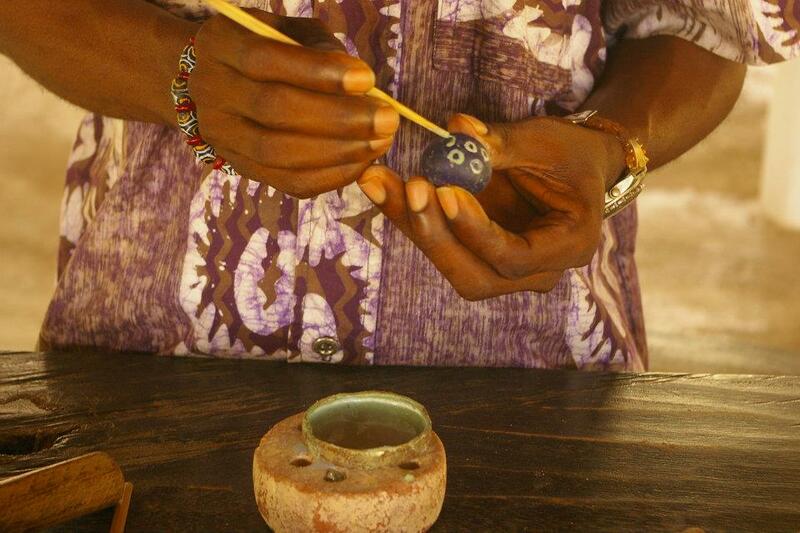 Keeping your African beads clean and beautiful is easier than you may think. 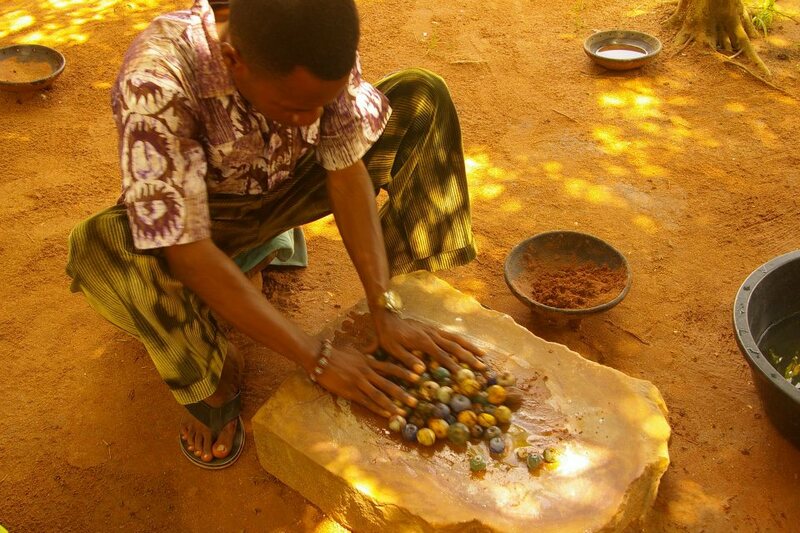 To clean most African beads use a small amount of Mineral Oil (found at your local grocers) on a clean cloth and rub. Not recommended for old or Antique beads as their dirt is well earned and adds to their history. Cleaning agents such as soap are not advised.